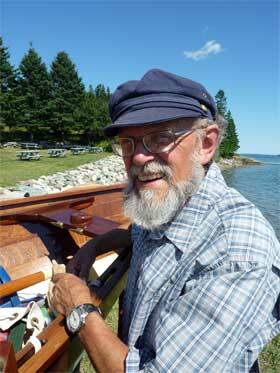 Three artfully crafted, owner built, wooden boats. I had the pleasure to be invited by Boston area boatbuilder and master cabinetmaker, Nathan Rome, to be his crew in the Small Reach Regatta, held in Frenchman Bay, Maine. Not only was this a wonderful opportunity to sail in his beautifully adapted version of a Kingston Lobsterboat, but it was also an occasion to see numerous other traditional sailing and rowing craft, many of them built by their owners. Nathan’s boat, the Bonnie Sea, is a roughly sixteen foot boat based on the 1872 Kingston Lobsterboat, the “Annie H. Fuller,” which Nathan saw, and fell in love with, at Mystic Seaport some years back. 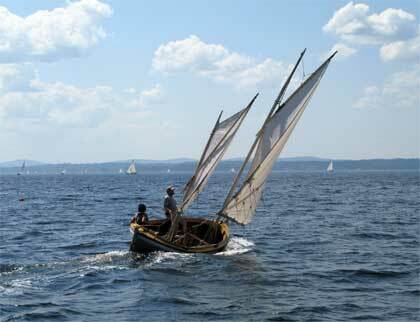 He got plans for the hull from Mystic Seaport, but then made various adaptations to the rigging and sail plan. 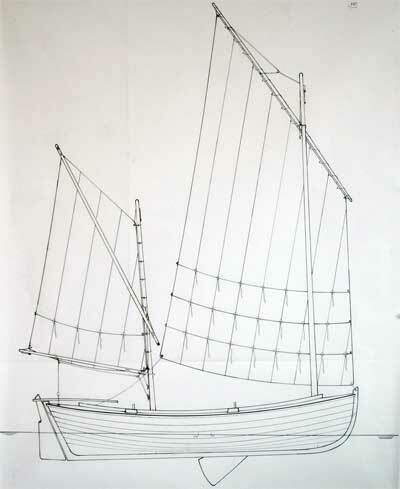 The original Kingston Lobsterboat was a two-sail cat-rigged ketch which Nathan adapted to a gaff-rigged sloop (with a single mainsail and a jib). 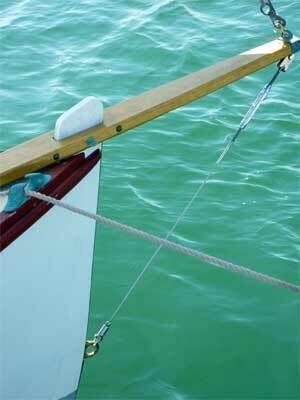 He added a bowsprit in order to push the center of force forward. I can attest that the bowsprit redesign enables the craft to sail well, as well as adding a good deal of elegance to its appearance. The boat, as realized by Nathan, is a model of craftsmanship, beautifully rendered. 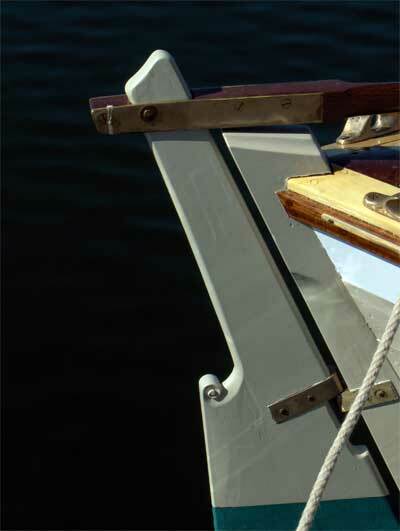 The spars (mast and boom) are constructed from laminations and wonderfully shaped. 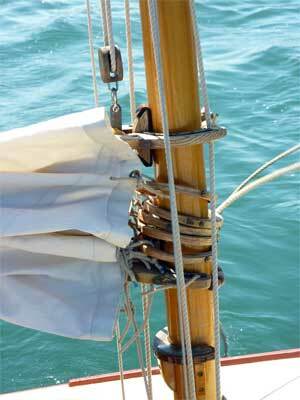 All of the fittings and the rigging look authentic, though some of them are modern constructions. The boat sails wonderfully in a nice wind, but a bit more sluggishly in light wind. It has about three hundred pounds of lead ballast under its floorboards and that does take a toll in drifting conditions. We did spend one day languishing in a floater on Frenchman Bay. Oars provide supplemental propulsion, and when one gets around to using them, they can drive the boat rather well. Perhaps, that day, we should have pulled them out sooner. As reported on the WoodenBoat magazine website, “Bonnie Sea won first place in the owner-built sailboat category at the 2008 WoodenBoat Show’s Concours d’Elegance.” Certainly, it is a deserved honor. I would also like to note the craftsmanship in the work of two other accomplished designer-boatbuilders, Andrew Kitchen and Tom Jackson, who were at the Small Reach Regatta as well. Andrew Kitchen is a retired computer science professor, originally from northern England, but now living in upper New York State. 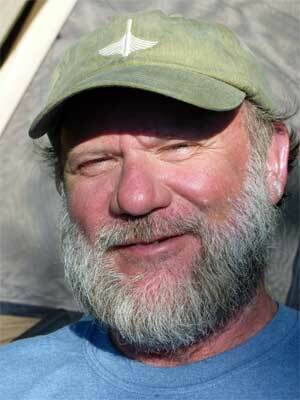 About ten years ago he constructed the boat he brought to the Small Reach Regatta, the Nina S. Benjamin. 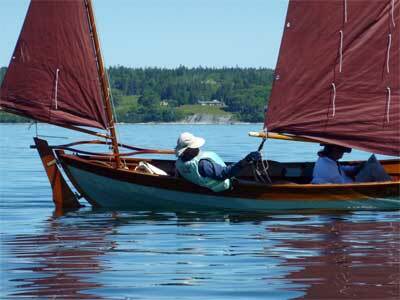 It is a dark colored JII yawl (designed by Iain Oughtred) with copper colored sails. Unlike Nathan’s boat which has strip (non-overlapped) planking in the hull, Andrew’s boat has lapstrake (overlapped) planking. The workmanship is very finely done, with great care in the details. Seeing the Nina S. Benjamin on the water is a majestic sight, its deeply colored double sails calling out from across the bay. 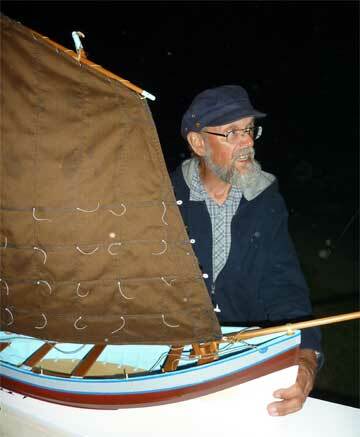 The Coble, a work boat from the coast of northern England is Andrew’s next project. He brought an exquisite model of it to the Small Reach Regatta and fascinated listeners not only with the projected design, but also with a description of the traditional manner of sailing the boat. Because the mainsail extends further forward than the mast, tacking the boat requires that the crew manually reposition the sail from one side of the mast to another. This is obviously a laborious requirement, but, according to Andrew, for work boats taking long tacks in the North Sea, was not such a big deal. Andrew’s commitment to recreating this piece of maritime history from the place of his youth is touching, and the result will no doubt be impressive. 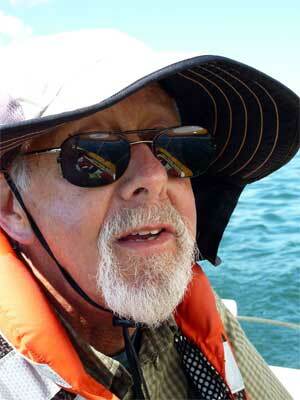 Tom Jackson, Senior Editor at Wooden Boat magazine and the organizer of the Small Reach Regatta, brought his adeptly constructed boat, Far and Away. It is, like Nathan’s adaptation of the Kingston Lobsterboat, a somewhat independently modified design, and also very beautiful. Far and Away is an adapted version of a Nomans Land Boat, originally designed and built on Nomans Land near Martha’s Vineyard. The hulls are extraordinary. In the best of them, the sheerline has a lovely upward sweep forward and aft, and the section lines aft have shapely reverse curves culminating in a steeply raked sternpost. They are commodious, inviting the imagination to wander. Martha’s Vineyard cod fishermen used them at nearby Nomans Land Island and praised their seaworthiness. They were drawn ashore at day’s end, and their sharp sterns facilitated relaunching stern-first into the surf. At season’s end, most were left ashore when the families moved home. They were well-built by capable craftsmen, including Joshua Delano of Fairhaven, who is said to have built 50 or 60 of them, and by the Beetle family of New Bedford, renowned whaleboat builders. 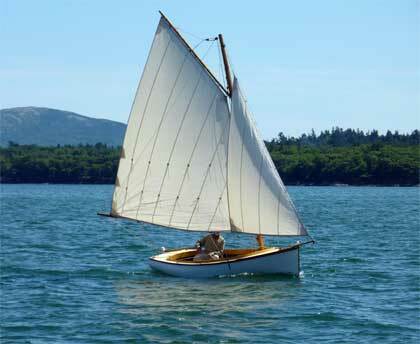 As with Nathan’s and Andrew’s boats, Tom’s is an adaptation of a sailing craft that was used for work purposes. During earlier centuries when such craft were functional tools of the economy their aesthetic aspects no doubt took a back seat to their practical ones. But, in retrospect, we can see how the carefully conceived aspects of their designs now contribute to their overall beauty as well as their seaworthiness. They are sturdy and practical boats, but they are graceful and poetic to watch. Each of these three craftsman-sailors is a devoted practitioner of this fine art. It was a pleasure to spend several days with them, and with numerous other accomplished builders of traditional wooden small sailing and rowing craft. Seeing their boats on land and water and listening to them describe in great detail the choices made and methods used for constructing these beautiful creations was a lesson in how close finely executed craft can come to expressive art. Each of these works is indeed, like other good crafts, planned and engineered, executed and tested, modified to work. And, as with great work of expressive art, these are adapted, cultivated and realized according to individual vision and interpretation. Whether one dubs them works of expressive art or finest craft, they are carried off through enormously painstaking labor and with great feeling for all the nuances of design and execution. Watching their creators tend them, talk about them and sail them is a moving experience indeed. And to watch forty or so of these traditional craft, most of them handbuilt, congregate upon the waters of Downeast Maine, is an enlivening and stirring experience.